Coventry City preserved their League One status with a win that relegated their hosts Crawley to League Two. The visitors, who needed a point to survive, saw Nick Proschwitz's first-half penalty saved by Brian Jensen. Crawley, who had to win to stand a real chance of staying up, then took the lead on 49 minutes when Mathias Pogba headed in Gavin Tomlin's cross. However, Marcus Tudgay levelled with a header before James Maddison slotted home a winner in the last minute. 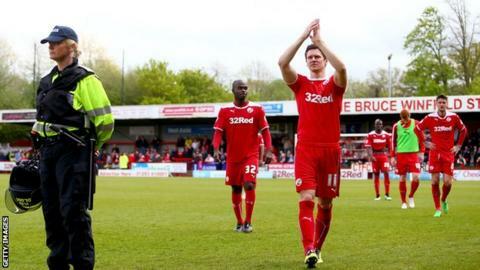 Crawley had spent three seasons in League One, having gone up in 2012, a second successive promotion, having entered the Football League in 2011. Dean Saunders' side them finish 22nd in the table, two points adrift of safety, while the Sky Blues ended up five points clear, climbing a place to 17th, one rung higher than they finished a year ago. Home goalkeeper Jensen had given his side a lifeline just before half-time when he kept out Proschwitz's weak penalty after Tomlin had brought down Tudgay in the box. And it got even better for the hosts three minutes into the second half when Pogba put the Reds in front with a towering header. But their delight turned to misery when Tudgay headed in Jim O'Brien's cross and substitute Maddison fired a low shot into the centre of the net from Frank Nouble's pass. "It's just a cruel game football. Last week was probably one of the biggest slaps I've ever had in the face. We were 3-2 up and today is another slap in the face. We were 1-0 up and in control. They didn't look like scoring. "But there's such a fine line between doing well and doing terribly and right now we've not got enough points to stay in the league. "Everybody's disappointed. We've done a great job in putting ourselves in the position with two games to go needing to win one. Today it makes you wonder why you do the job. "I won't look back on the results. We've had some great ones, winning six out of eight at home and we've beaten a lot of top teams. We've still come up short on 50 points and it wasn't enough this year." "I'm relieved for the Coventry support, because it's a long way back from League Two. The club needs to stabilise and build from this low point. "Will I be here next season? I hope so. I think so. I've really enjoyed the last seven or eight weeks. It's good to get back on the training ground and organise a team. "It's important that the club realises what needs doing behind the scenes. Some things amaze me that are not in place, and other things are very, very good at this football club. "This club deserves to be and should be higher than we are at the moment." Match ends, Crawley Town 1, Coventry City 2. Second Half ends, Crawley Town 1, Coventry City 2. Izale McLeod (Crawley Town) wins a free kick in the defensive half. Substitution, Coventry City. Andy Webster replaces Jim O'Brien. Goal! Crawley Town 1, Coventry City 2. James Maddison (Coventry City) right footed shot from the centre of the box to the centre of the goal. Assisted by Frank Nouble. Attempt blocked. Reda Johnson (Coventry City) header from the centre of the box is blocked. Corner, Coventry City. Conceded by Bobson Bawling. Corner, Coventry City. Conceded by Gwion Edwards. Attempt missed. Marcus Tudgay (Coventry City) header from the centre of the box is close, but misses to the left. Attempt blocked. John Fleck (Coventry City) right footed shot from the left side of the box is blocked. Substitution, Crawley Town. Gwion Edwards replaces Kelly Youga. Substitution, Crawley Town. Bobson Bawling replaces Josh Simpson. Corner, Coventry City. Conceded by Kelly Youga. Delay in match James Maddison (Coventry City) because of an injury. Attempt saved. Marvin Elliott (Crawley Town) right footed shot from outside the box is saved in the top centre of the goal. Attempt missed. Jim O'Brien (Coventry City) header from the centre of the box is close, but misses the top left corner. Corner, Coventry City. Conceded by Darren Ward. Goal! Crawley Town 1, Coventry City 1. Marcus Tudgay (Coventry City) header from very close range to the top left corner. Assisted by Jim O'Brien. Substitution, Crawley Town. Lanre Oyebanjo replaces Lewis Young because of an injury. Attempt missed. James Maddison (Coventry City) right footed shot from outside the box is just a bit too high. Delay in match Chris Stokes (Coventry City) because of an injury. Corner, Coventry City. Conceded by Sonny Bradley. Attempt blocked. Jim O'Brien (Coventry City) right footed shot from outside the box is blocked. Kelly Youga (Crawley Town) is shown the yellow card. Foul by Kelly Youga (Crawley Town). Substitution, Coventry City. Frank Nouble replaces Nick Proschwitz. Delay in match Lewis Young (Crawley Town) because of an injury. Substitution, Coventry City. James Maddison replaces Adam Barton. Attempt saved. Izale McLeod (Crawley Town) left footed shot from a difficult angle on the left is saved in the bottom left corner. Goal! Crawley Town 1, Coventry City 0. Mathias Pogba (Crawley Town) header from the centre of the box to the top right corner. Assisted by Gavin Tomlin. Foul by Mathias Pogba (Crawley Town). Aaron Martin (Coventry City) wins a free kick on the left wing.